Material Resourcers specialize in reclaimed and repurposed materials like these split wine barrel halves. Reclaimed from wineries in Napa, they now have a second life as a rustic wall accent, wine table, or out in your garden. We inspect each one carefully to ensure the finished half we create will bring you years of enjoyment. 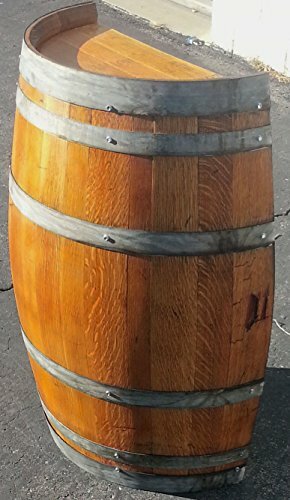 Some of our wine barrels have unique staining from the red wine that was aged inside, or maybe cleaner if they were only used once to age wine. Each barrel is unique and may differ slightly in appearance than what is pictured. Some have winery engravings, markings, or branding on the barrel tops as well. Oil-based stain helps protect against weathering but will need to be reapplied as needed. If you have any questions about this product by MR-UTAH.com, contact us by completing and submitting the form below. If you are looking for a specif part number, please include it with your message.